Stress is such a familiar part of women's lives that many just squeeze a pregnancy right into all the hubbub. Even if women wonder whether it's bad for their developing fetuses, it's often hard to get a straight answer, mainly because most doctors don't know how much stress is too much or for whom. For one thing, a growing number of studies are confirming what used to be considered just an old wives' tale ­- that stress really isn't good for pregnant women. It not only increases the risk of pre-term labor, but possibly a host of other problems for babies after birth. Even more important and clearly more difficult to discern; researchers are close to being able to predict who is most susceptible to stress and at highest risk for complications, such as pre-term birth. In fact, some say it won't be long before health-care providers have the tools to head off these problems before it's too late. Stress is a silent disease. 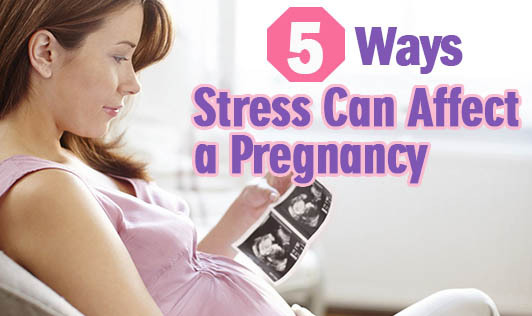 Pregnant women need to be educated in recognizing when they have stress, the consequences, and some of the simple things they can do to make a difference. Throw Out the Blueprint Developmental biologists once thought fetuses were conceived with a blueprint from their parents' genes. As long as you gave the growing fetus the right nutrients and avoided harmful substances, this blueprint would develop into a healthy baby. That's not what experts believe anymore. This view has more or less been completely turned upside down At each stage of development, the organism uses cues from its environment to decide how best to construct itself within the parameters of its genes. Stress is an example of how a fetus responds to stimuli in the womb and adapts physiologically. When the mother is stressed, several biological changes occur, including elevation of stress hormones and increased likelihood of intrauterine infection. The fetus builds itself permanently to deal with this kind of high-stress environment, and once it's born may be at greater risk for a whole bunch of stress-related pathologies. Pre-term births and low birth weight are among the most recognized effects of maternal stress during pregnancy, established over nearly two decades of animal and human research. Recent studies suggest that women who experience high levels of psychological stress are significantly more likely to deliver pre-term. Typically, one in 10 women delivers pre-term (before 37 weeks). Pre-term babies are susceptible to a range of complications later, including chronic lung disease, developmental delays, learning disorders, and infant mortality. There's even compelling evidence from epidemiological studies and animal research that babies who experience stress in utero are more likely to develop chronic health problems as adults, such as heart disease, high blood pressure, and diabetes. Most recently, some studies are suggesting that stress in the womb can affect a baby's temperament and neurobehavioral development. Infants whose mothers experienced high levels of stress while pregnant, particularly in the first trimester, show signs of more depression and irritability. In the womb, they also are slower to habituate or tune out repeated stimuli, a skill that, in infants, is an important predictor of IQ.